Don’t cross paths with Jackie Floyd unless you’ve got time to spare. The soft-spoken community leader is always ready to discuss the transformation of her west Louisville neighborhood. And after hearing her talk about ongoing positive changes, you may find yourself promising to get involved. One of Floyd’s greatest abilities is inspiring people to act, say those who’ve worked with her. And as Louisville’s struggling urban neighborhoods continue to rebuild, it’s become a skill that’s desperately needed. “For whatever reason, some people sometimes feel they can’t make a difference, they’re overwhelmed by the magnitude of what needs to be done,” said Kathleen O’Neil, who’s worked with Floyd on revitalizing the Russell neighborhood. Floyd, 65, never saw herself becoming a community activist. She spent much of her life caring for five children and her ailing husband, and when she first entered the nonprofit sector, she wasn’t working directly with people in her neighborhood. That changed a few years ago after Floyd joined Vision Russell, a grant-funded revitalization effort led by the Louisville Metro Housing Authority. New Directions, the authority’s partner agency, hired Floyd to lead the initiative’s community outreach, and she got to work encouraging neighbors to attend meetings and voice their opinions about the developing plans. “That was my theme song,” Floyd said about seeking input. “In the black community, so many people have come down and said, ‘Hey, we’re here and we’re going to save you.’ Then when the money’s gone, they’re gone and the promises are broken. O’Neil, the housing authority’s executive planner, said Floyd played an integral role in identifying the neighborhood’s most prominent needs, and her passion for the project was unwavering. 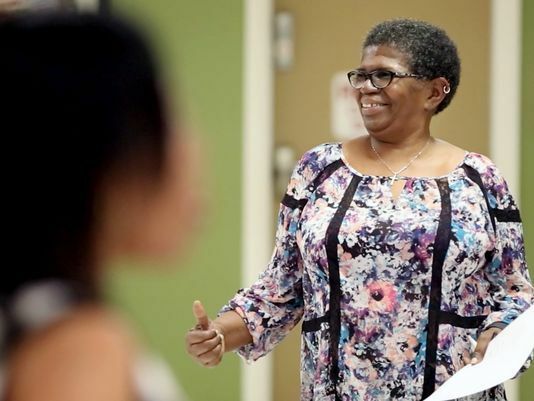 When her contract with Vision Russell ended, Floyd decided to continue her community work with the Center for Neighborhoods, a Louisville nonprofit that works to embolden community leaders. As a neighborhood liaison, Floyd works with people who want to start neighborhood associations and block clubs within her designated Metro Council districts. And she calls on the groups to support each other when issues arise. Earlier this year, Floyd asked associations in several west Louisville neighborhoods to speak against plans for an unwanted liquor store in the Russell area. Tom Stephens, executive director of the Center for Neighborhoods, said Floyd has a way of speaking to people across generations that makes them want to get involved. She’s known to have kitchen conversations with elderly neighbors who can’t leave their homes, and she’s learned how to interact with teens while raising her 14-year-old grandson.